A 360º tour refers to an experience that simulates an in-person visit through the surrounding space. This “walkthrough” visit is composed of scenes in which you can look around at any point, similar to how you can look around in Google Street View. In a 360º tour, different scenes are accessible via discrete hotspots that users can enable or jump into, transporting themselves to a new place in the tour. The magenta octahedron represents the user’s point of view. The image covers the inner surface of the sphere. With A-Frame, creating such an experience is a surprisingly simple task. In photography, panoramas are essentially wide-angle images. Wide-angle means wide field of view, so the region of the physical space captured by the camera is wider than in regular pictures. A 360º panorama captures the space all the way around the camera. In the same way that wide-angle photography requires special lenses, 360º panoramas require special cameras. 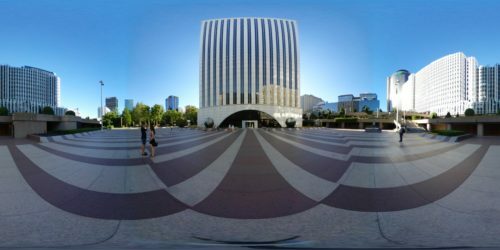 You can read Kevin Ngo’s guide to 360º photography for advice and recommendations when creating panoramas. To undo the distortion, you have to project the rectangle back into a sphere. With A-Frame, that means using the panorama as the texture of a sphere facing the camera. The simplest approach is to use the a-sky primitive. The projection of the image must be equirectangular in order to work in this setup. 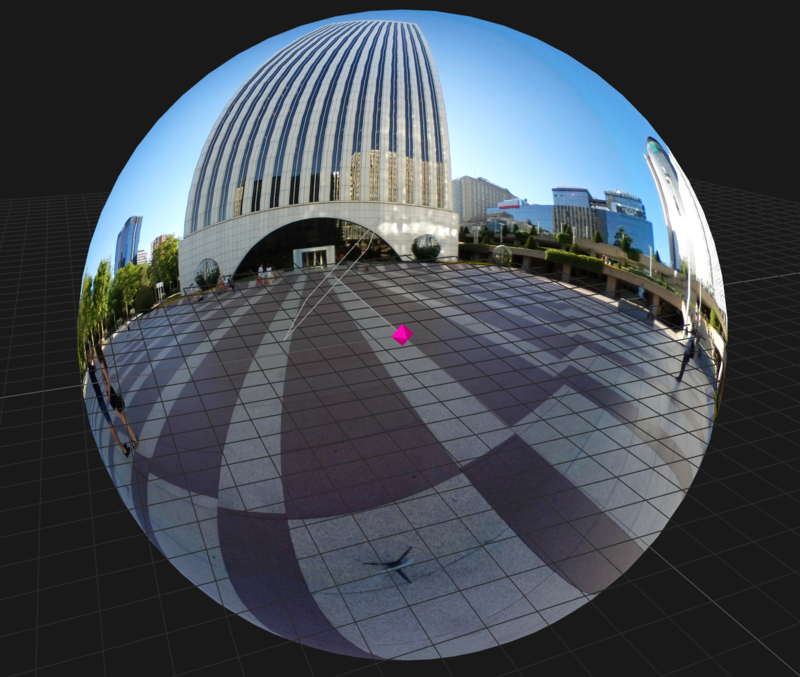 See the Pen 360º panorama viewer by Salvador de la Puente González (@lodr) on CodePen. 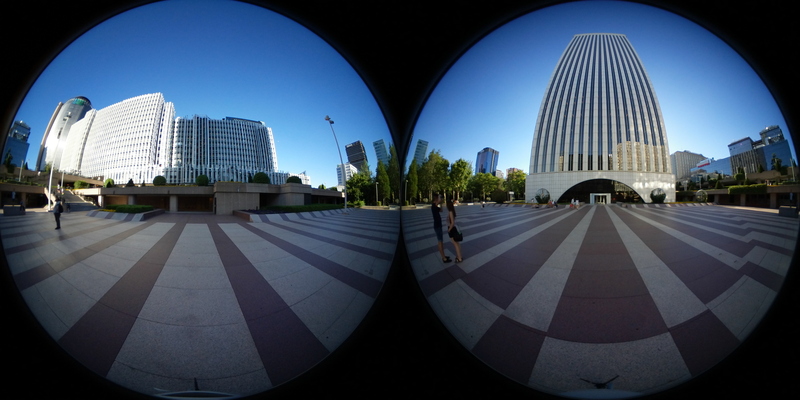 Getting equirectangular images actually depends on the capturing device. For instance, the Samsung Gear 360 camera requires the use of official Samsung stitching software to combine the native dual-fisheye output into the equirectangular version; while the Ricoh Theta S outputs both equirectangular and dual-fisheye images without further interaction. 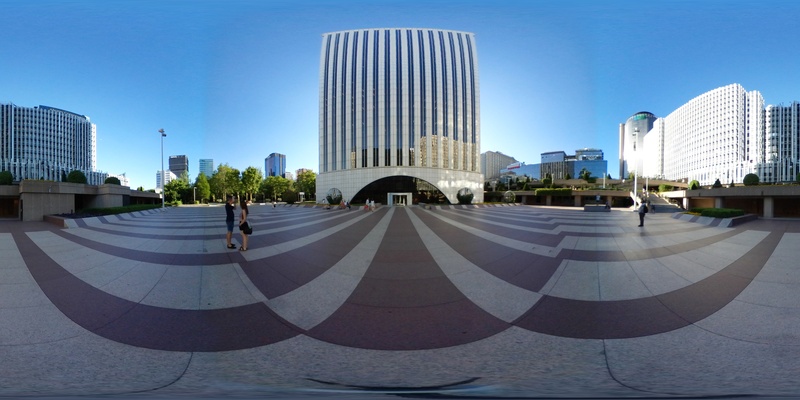 A dual-fisheye image is the common output of 360º cameras. A stitching software can convert this into an equirectangular image. To create such an experience, you can use the 360 tour template that comes with aframe-cli. The aframe-360-tour-template encapsulates the concepts mentioned above in reusable components and meaningful primitives, enabling a developer to write semantic 360º tours in just a few steps. And visit http://127.0.0.1:3333 to experience the tour. Save and reload your browser tab to see the new results. Remember that in order to activate a hotspot, while in desktop mode, you have to place the black circle over the magenta octahedron and click on the screen. Positioning hotspots can be a frustrating endeavour. Fortunately, the template comes with an useful component to help with this task. Simply add the hotspot-helper component to your tour, referencing the hotspot you want to place as the value for the target property: <a-tour hotspot-helper="target: #corner-to-garden">. The component will move the hotspot as you look around and will display a widget in the top-left corner showing the world position and rotation of the hotspot, allowing you to copy these values to the clipboard. You can customise the hotspot using mixins. Edit index.html and locate hotspot-text and hotspot-target mixin primitives inside the assets section. For instance, to avoid the need to copy the world rotation values, we are going to use ngokevin’s lookAt component which is already included in the template. <a-entity cursor="fuse: true; fuse-timeout: 2000" position="0 0 -1"
Once you add fuse: true to your cursor component, you won’t need to click on the screen, even out of VR mode. A click event will trigger after fuse-timeout milliseconds. <a-animation begin="fusing" end="mouseleave" easing="ease-out" attribute="scale"
fill="backwards" from="1 1 1" to="0.2 0.2 0.2"
Click on the picture above to see fuse and the animation feedback in action. Sound is a powerful tool for increasing the illusion of presence. You can find several places on the Internet offering royalty-free sounds like soundbible.com. Once you decide on the perfect ambient noise for the experience you’re creating, grab the file URL or download it if not available and serve the file locally. Create a new folder sounds under app/assets and put the audio file inside. Adjust the volume by modifying the volume property which ranges from 0 to 1. 360º tours offer first-time WebVR creators a perfect starting project that does not require exotic or expensive gear to begin VR development. Panoramic 360º scenes naturally fall back to regular 2D visualization on a desktop or mobile screen and with a cardboard headset or VR head-mounted display, users will enjoy an improved sense of immersion. With aframe-cli and the 360º tour template you can now quickly set up the basics to customise and publish your 360º VR tour. Create a new project to show us your favourite places (real or imaginary!) by adding panoramic views, or start hacking on the template to extend its basic functionality. Either way, don’t forget to share your project with the A-Frame community in Slack and Twitter. Thanks for the article. Do you know if/when we will be able to walk around and interact with browser content in AFrame/WebVR? All the effort seems to be around bringing VR to web browsers but I am more interested in bringing the web into VR. Basically a fully functional div container serving as a surface texture would be a good start for all sort of creativity. The codepen is SOO cool. its 5 lines of Code + Image. This is just amazing to all extends! Neat I didn’t know aframe-cli even existed! Great to see components as and since it’s such a recurring need but also to make it efficient on the production side. PS: for Samsung their tool is optional, an alternative is to use the gear360pano script for hugin cf https://github.com/ultramango/gear360pano (CLI). Oh! Thank you for the script, it’s fantastic to know there is a CLI alternative.